Westborough – Bradley Russ was only 2 years old when the Sept. 11, 2001, terrorist attacks occurred, but in the ensuing years, he has, of course, heard stories of that day, particularly about the first responders. So it was important to him, he said, to be part of the Westborough Sept. 11 10th anniversary observances that were held at Westborough High School&apos;s Joseph Mewhiney Field the evening of Sept. 11. 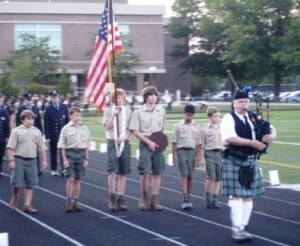 Bradley, along with several fellow members of Boy Scout Troop 100, served as part of a color guard at the ceremony. The interfaith ceremony was organized by the Westborough 9/11 10th Anniversary Committee. Selectman Lydia Goldblatt served as the committee&apos;s chair. 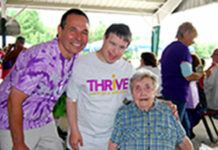 In a prior interview, Goldblatt spoke of why holding the event was important. Before the official ceremony, 30 volunteers took turns reading the names of the victims of the attacks. Residents sat silently in the bleachers, as the names of the 3,000 victims carried through the field complex. A large American flag hung from the extended ladder of the Fire Department&apos;s Ladder 1. Lining the field&apos;s track were hundreds of luminary bags, each with the names of 10 victims, as well as messages and drawings of love, hope and friendship from local school children written on them. 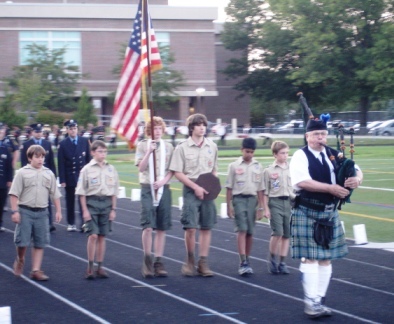 During the ceremony, leaders of the town&apos;s religious communities entered the stadium preceded by a bagpiper, the Scouts” color guard and members of the Police and Fire departments. Interspersed throughout the ceremony were musical selections by Westborough High School&apos;s string quintet and marching band. Other selections were performed by the Journey Home Singers and cellist Christy Tsen, who was accompanied by Rev. Elizabeth Kubota. As the ceremony neared its conclusion, a final moment of silence was held, as darkness fell over the field. The only light left was from the spotlights on the flags, the full moon and the luminary bags along the track. 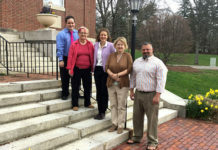 In Marlborough, a ceremony that was held on the lawn of the Walker Building featured keynote speaker, Anita Arnum, an Acton firefighter and a member of the Massachusetts Urban Search and Rescue Task Force. Arnum was part of a search-and-rescue team at ground zero. 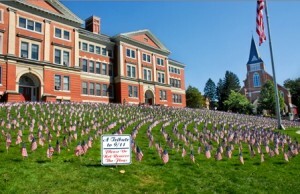 Three thousand American flags also adorned the lawn in memory of those who perished. 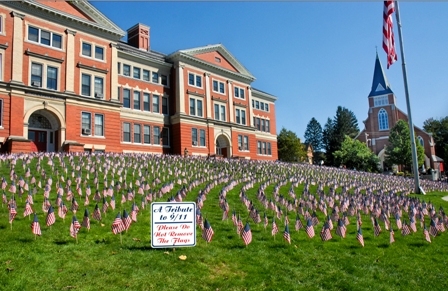 Other local towns, including Shrewsbury, Southborough and Hudson, also held Sept. 11 commemorations.